Diamondite Perfect Vision Glass Cleaner Aerosol is a foaming surfactant cleaner that lifts and removes grease, bugs, and films from automotive glass better than any ammonia-based glass cleaner. Wipe away smoker’s film to reveal a perfectly clear, streak-free shine. 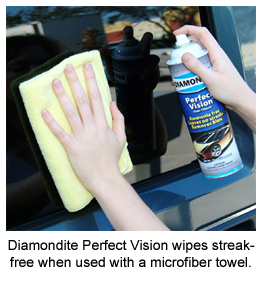 Diamondite Perfect Vision Glass Cleaner™ gives you a perfectly clear vision of the road ahead. The aerosol form of Diamondite Perfect Vision Glass Cleaner clings to the glass with a low-moisture foam. With less wetness to wipe away, you’ll be able to get a streak-free shine with less wiping and buffing. Plus, the aerosol foam is easy to direct with little or no overspray. If overspray does occur, just wipe it away. Because there is no ammonia, Perfect Vision will not dry out surfaces or cause them to yellow. The key to cleaning automotive glass, particularly the windshield, is to use long strokes in both directions. Use a soft, clean Microfiber Glass Towel to wipe up and down in long strokes. You should start at the top of the glass and wipe all the way to the bottom. Then flip the towel and wipe across the glass at least to the middle of the windshield. Getting auto glass completely clean may require a couple of tries – after all there is airborne pollution and oil on it – but the good news is that you can achieve perfectly clear, streak-free glass with Diamondite Perfect Vision Glass Cleaner™. Diamondite Perfect Vision Glass Cleaner Aerosol is made of the finest quality cleaning agents that are proven to clean glass better than over the counter or household cleaners. Improve the appearance and clarity of your windshield and windows for a more perfect vision of the road ahead.